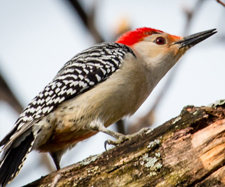 Blog » Tishomingo National Wildlife Refuge - Adventure Awaits! 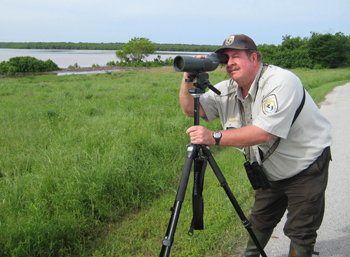 If you’re eager to explore for birds and other wildlife, a trip to a national wildlife refuge could be just the thing! There are more than 500 of these wild places in our National Wildlife Refuge System. No state is without them, and as Americans, we own them all. 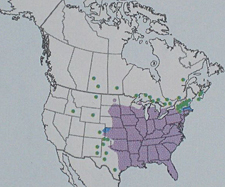 The refuges are managed by the US Fish and Wildlife Service. 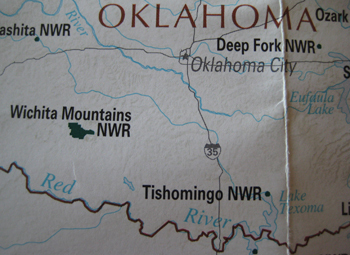 The Red River (which forms much of the state’s southern boundary) runs near, as does the Washita. Filled by an arm of the huge Lake Texoma, Cumberland Pool makes up about a quarter of the 16,464 acres of the reserve. 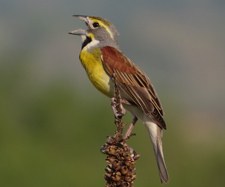 So in a region that can be dry, birds and wildlife find the water and wetlands along with the woodlands and grasslands they seek. A sign at the entrance describes Chief Tishomingo – after whom the reserve is named - as the last full-blooded Chickasaw warrior chief. Living from about 1735 to 1839 (yes, more than 100 years), he served as chief counselor and national orator for the Chickasaw Nation. He died on the Trail of Tears near Little Rock or Fort Smith, Arkansas, and is featured on the Great Seal of the Chickasaw Nation. As a girl, I lived in Tulsa, so I was eager to return to Oklahoma after many years away. 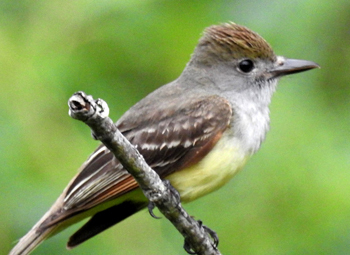 It had been too long since I’d seen a Great Crested Flycatcher or a Painted Bunting. 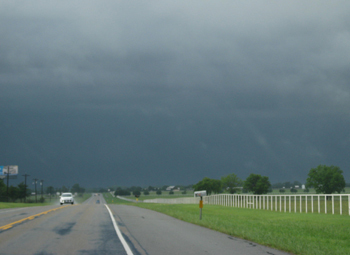 The day of my visit in May, the weather was threatening. We had quite an adventure just getting there! 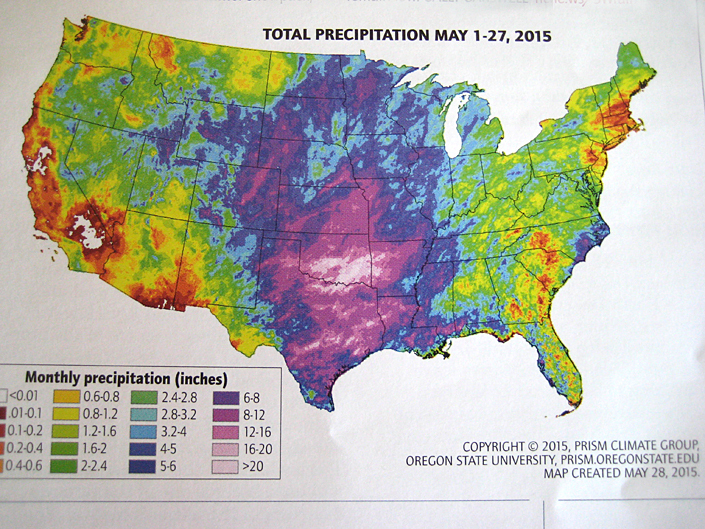 Look at this map of total precipitation for the USA for May 1st – 27th, and you’ll see that we were in the area of heaviest rainfall. Days later, much of the refuge was flooded beyond being accessible. But those conditions were an anomaly. 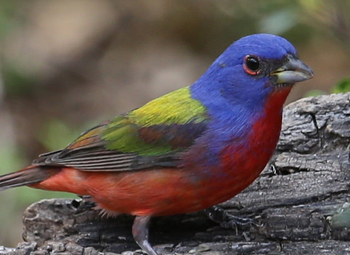 Nestled in south-central Oklahoma, the refuge was established in 1946 to benefit migratory waterfowl in the Central Flyway and to help conserve America’s wildlife heritage for current and future generations. 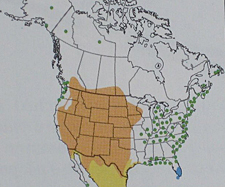 As these range maps from The Sibley Guide to Birds show, Tishomingo is located in a most advantageous spot. 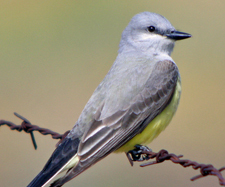 We were able, for example, to see Western Kingbirds and Dickcissels at the same time. It’s fun to learn from the experts! Any time you’re around people who love their work, you know it’s going to fun. At Tishomingo, one such person is Justin Roach, the chief wildlife biologist. Justin’s a man with a terrific ear for bird calls and bird song, so he helps you zero in on the birds even before you see them. 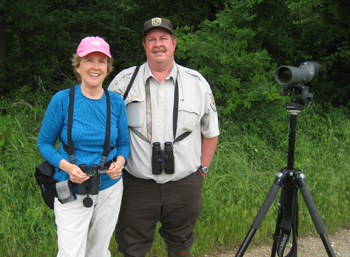 After birding only a few hours with him, we had seen 71 species of birds – from Least Terns to Mississippi Kites to Summer Tanagers. Justin has a lifetime of knowledge about the ecosystem at Tishomingo. He shares what he knows using layman’s terms, eagerness, and humility. In winter, it’s a resort for Snow Geese. Thousands upon thousands of gulls and terns sweep through each spring and fall. Summer is a time to angle for catfish. And autumn brings the southern migration of birds, as well as the spectacle of monarch butterflies migrating to Mexico. Intriguing birds, a wide array of plants, sincere and knowledgeable people. They’re at a national wildlife refuge near you. I hope you have a great time! 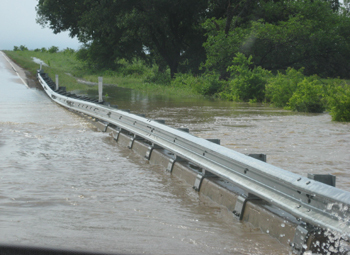 Due to the severe flooding, Tishomingo NWR is currently closed. Please check the USFWS Southwest Region Facebook page for more info. 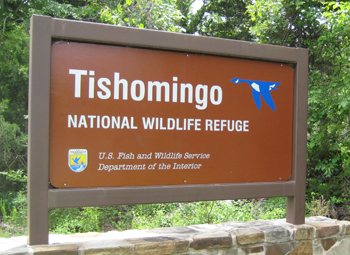 Learn more about Tishomingo National Wildlife Refuge. Find a national wildlife refuge near you. 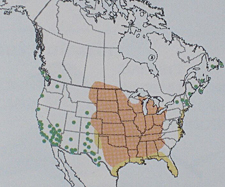 Range maps from The Sibley Guide to Birds, written and illustrated by David Allen Sibley, published by Alfred A. Knopf, Inc. Copyright © 2000 by Chanticleer Press, New York.